Grafting is an absolutely necessary skill for bonsai. Practice makes perfect, but I’ll settle for good. This arakawa maple is a layer of a larger tree that is no longer in my collection. 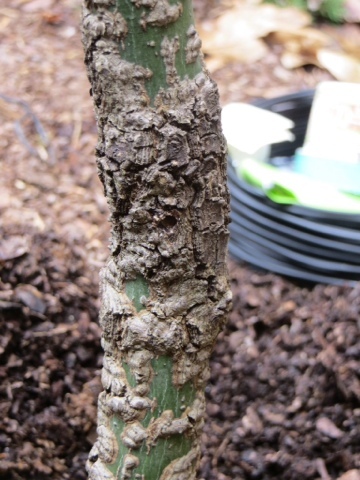 It’s been in the ground for the last 2 years, and while the nebari was arranged nicely and is developing well, the branches start very high up on the tree. 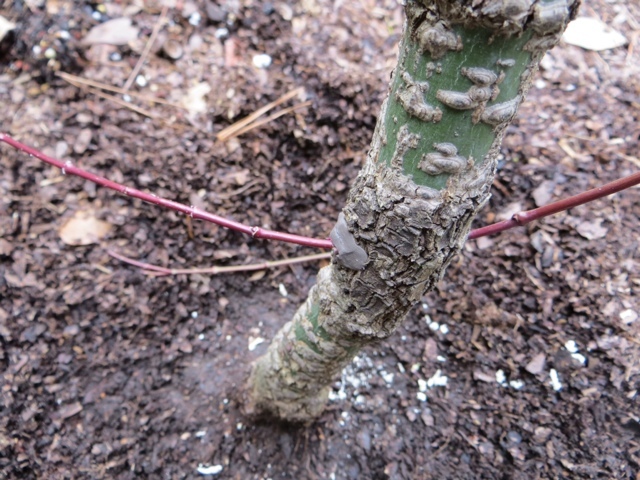 Last year, I let long branches grow with the intent of grafting them back in, lower on the trunk. 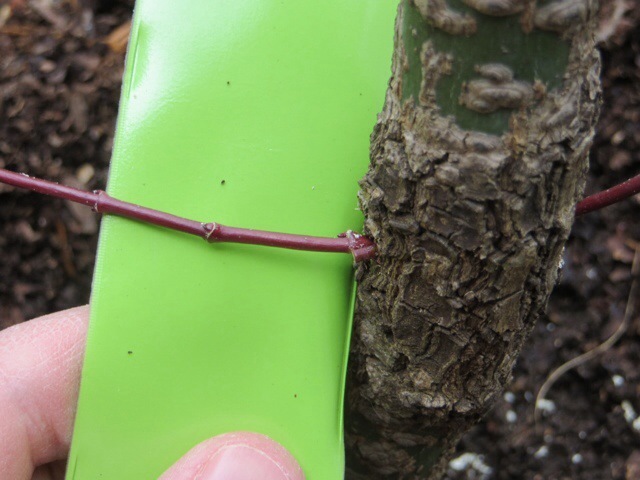 Many methods of grafting exist, but thread grafting is usually the most fool-proof for adding branches to deciduous trees because the scion is not severed from the stock until adherence is complete. It must be done before the buds start to swell, and since this tree is in a fairly protected area, it’s a little ahead of most on the benches. The work was done on 2/8. 1. 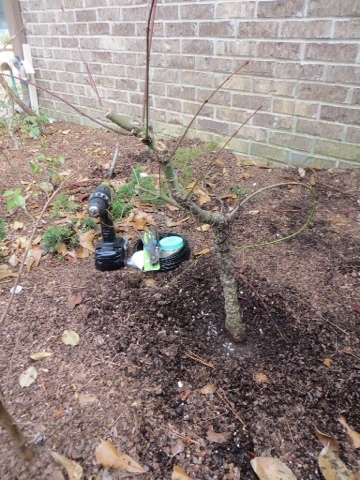 Determine the desired location for the new branches to emerge. 2. Ensure the scion can reach the spot, with plenty of room to run it through the trunk. 3. Find a long drill bit that will make a hole slightly bigger than the scion. 4. Drill the hole in the opposite direction the scion will travel through. The entrance hole is cleaner than the exit hole, and the cambium must be in good shape on the side where the scion will emerge and ultimately join to the trunk. 5. 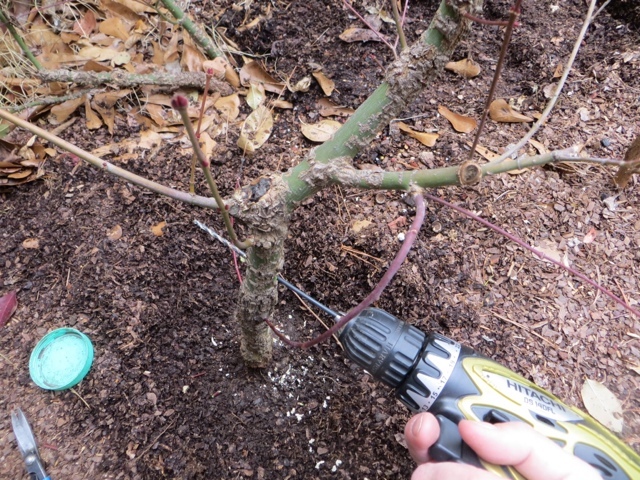 Thread the scion through the hole and ensure viable buds aren’t scraped off as the shoot passes through. 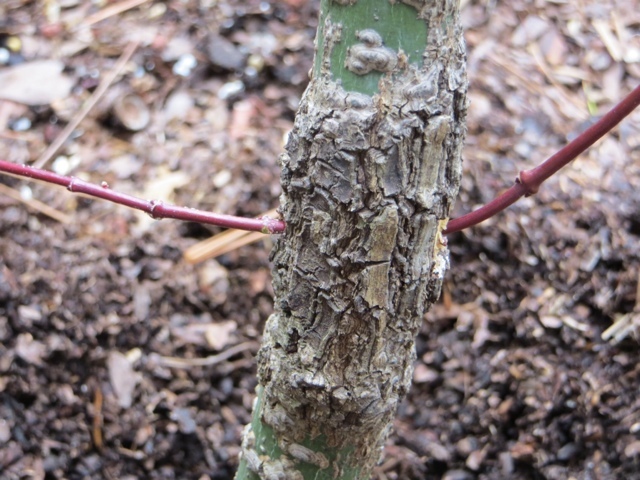 Also ensure that viable buds emerge close to the trunk, so the first node isn’t too far out. 6. 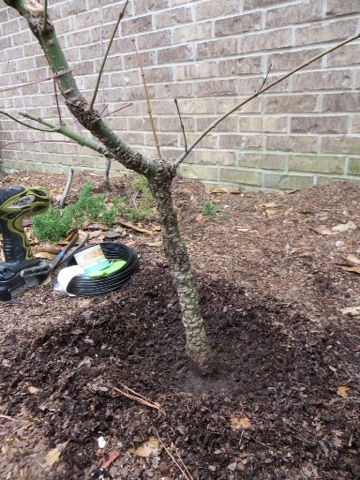 Using a small twig from the same tree, wedge it in on one side of the scion to ensure good contact at the trunk/scion union on the other side. 7. Apply cut paste around the hole to keep it from drying out. Awesome! keep us posted. Thanks. Ditto to the Awesome! This looks to be easy and safe. This came at a great time, Thanks! Can we see a picture of the original tree?